Hiroshima was founded in 1974 by Dan (sax) and June Kuramoto (koto). This ensemble was joined by taiko drummer Johnny Mori, drummer/percussionist Danny Yamamoto and keyboardist Kimo Cornwell. The lineup today includes besides the above mentioned artists bassist Dean Cortez, vocalist Terry Steele and guitarist Fred Schreuders. The name of the group is taken from the Japanese city that sustained a nuclear blast during World War II, yet roses from the ashes. A motif also mirrored in the first track of the new album "The Bridge". To understand their music it's necessary to know more about those Japanese instruments. The Koto is an instrument related to the zither. A traditional Koto has 13 strings, being arched tautly across 13 movable bridges along the length of the instrument. Players make base pitches by moving these 13 bridges before playing. The Taiko (large drum) is played in India through China, Mongolia, Southeast Asia and Korea. The Japanese-American Taiko varies slightly from the Japanese version. The Americanized version often uses wine barrels for the main body. 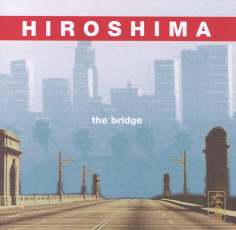 "The Bridge" is Hiroshima's debut album on the Heads Up Records label. "We looked at who we are when we came up with the title," comments Dan Kuramato, the band's leader and producer. ""For us, "The Bridge" has many different meanings, including cultural and artistic bridges. As a third generation Japanese, it's about growing up here and trying to integrate socially. Also the music business has continued to change its complexion, and as a group we need to constantly reinvent ourselves while staying true to our artistic vision. We're bridging a lot of things right now." Eternal Phoenix is a premium example for Hiroshima's typical sound, a mélange of Eastern and Western Pop music with a special piano excursion into jazzy improvisation. Dan Kuramato is playing fue, a Japanese flute. While typically simple in construction, fue require a high level of craft to create a quality, in-tune instrument. Dan plays it masterly, the clear tone is easy to hear and the melody will be remembered. The rhythm reminds at the captivating sound of 3rd Force. Caravan Of Love is a flash back to the splinter group of Ernie and Marvin Isley, plus their cousin Chris Jasper, former part of the Isley Brothers. Terry Steele, who penned Luther Vandross' "Hear And Now", creates a classic R&B feeling. The instrumental Shaka Phonk is featuring June Kuramato on koto. She is a virtuoso and the musical heart of the group. Anew Kimo Cornwell delivers a jazz fusion attitude on acoustic piano, superb. A slow love song with much sensitivity is creeping into your heart with Believe. "The more that you want it, the more that you need it, the more you'll believe. I need you oh so much. Trust in me." is the message in a silky package delivered by Terry Steele. A jamming tune in the style of Les McCann like Revelation will find your attention. Another Wish is a reminiscence of Hiroshima's former hit "One Wish" (1985), a tune for peaceful hours. George Benson sang it on his album 20/20 (1985) : I Just Wanna Hang Around You. Terry Steele sings it now again with more emotion. Back to the roots with Manzanar. This song is dedicated to the parents of Hiroshima, the Nisei. The Japanese atmosphere is woven by koto and shakuhachi. Viven has a vivid Afro/Brazilian rhythm with a propulsive bass, the melody is drifting into New Age. A slow contemplative Sanju presents Dan Kuramoto's Soprano sax in company with some synthesizers interplay. Seven Rivers are to find on many locations. The rivers of this song are flowing in Hiroshima. It's a ballade about the spirit of people of this haunted city and their rise from the ashes. The combination of traditional Japanese instruments like koto and shakuhachi with modern instruments is attractive and has its own charm. Together with Terry Steele's seductive voice Hiroshima's music is irresistible.